Lying about a 2 hour 4WD from Cooktown depending on road conditions is the Starke river and its tidal tributaries to the south. Access is limited during the wet but usually by May anglers are starting to get in. There’s a no fishing green zone restriction seaward of the river and tributaries in place. Some scintillating sport fishing can be had fishing for big barra and mangrove jack on fly and lure inside the mouths of some amazing tidal inlets. Plenty of good sized tarpon, trevally and queenies can be found to fill in the quieter times. An all weather boat ramp lies at the mouth with camping spots in close proximity,allthough sand flies will carry you away on a still night. A beach just to the south of the mouth has a camping area which is probably a better choice on calmer days. When navigating this river do so with extreme care especially on low water, fairly serious rock bars are scattered throughout the system. Fishing can be absolutely amazing but picking your weather and tides to enhance your chances is recommended. Superb mud crabbing can be had in the tidal inlets. The beginning of Queensland’s second largest National Park lies approx 2hrs 4WD north of Cooktown and is where some of the best Barra fishing in the country can be found. Campgrounds and boat ramps/launching spots can be found throughout the park, but camping is no longer self-registered, you need to book online, visit a QPWS office, or book by telephone; use the link below to access the Parks web site and register. Kalpowar crossing has running water, showers and toilets and being centrally located it is a great base camp to explore the Park. Detailed maps and camp information can be obtained from Queensland Parks & Wildlife. There are 4 major river systems the Normanby, the Kennedy, the Bizant and the Marret flowing through the park out into Princess Charlotte Bay. There are kilometers and kilometers of waterways to explore as well as the countless lagoons and billabongs. Access is during the dry season only as the rains make it impossible to explore. Usually by May camp sites are opening up. If you’re looking for that truly Australian camping/fishing experience then this is the place to go. Many metre plus “wild” barra are landed here every year with casting or trolling lures being the most successful method. Pick your moon phase and water temperatures to get the best from the area because on its day it will compete with any fishery in the world! Like everywhere up north saltwater crocodiles inhabit this area so always be crocwise. Fishing from the banks is possible in a number of areas but is not for the faint hearted. To really get amongst it a small tinnie/punt is necessary. No hire boats are available but self drive or guided options will provide you with a truly unique range of habitats and fishing opportunities. When you have areas such as Princess Charlotte Bay, Bathurst Bay, Bathurst Heads and, Cape Melville Nat Park all coming together in such close proximity it all adds up to one of the best fishing/camping destination experiences ever. 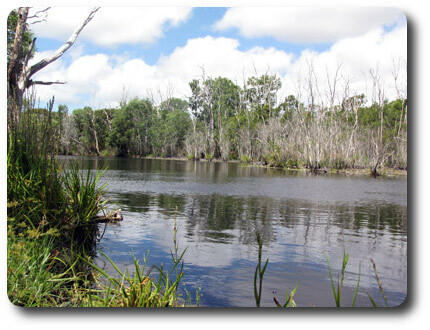 It has been described as the best fishing hole in Australia. Access is usually limited to the months of May through to November. There are a few motherships that work the area allowing access during the build up and run off when the area is at it’s best. The Wet season break enables it to rejuvenate and replenish itself for the following year. The Flinders group of islands can be explored on a good day in a tinnie but a good advice would be to travel in pairs and make sure safety gear is up together as you are in a truly remote spot. Big Coastal barra well over that magical metre are caught every year. These fish are not your regular impoundment fish, they’re wild and the challenge is there for the discerning fisherman. Working the mangrove edges whilst underway with an electric motor on a rising tide or just throwing a livey around the creek mouths can see cricket score returns on barra, jacks, fingermark, trevally and queenfish. Beware navigating on a dropping tide in PCB as many an angler has been left high and dry from camp with hundreds of metres of mud between them and shore. Mud crabbing in these areas is second to none so catching a feed is fairly straightforward. Best times for fishing are early on in the season when the rivers are running well or when it’s stinking hot, although fishing in the middle of winter can also be outstanding. More info/maps/camping registration, can be obtained from QPWS or GBRMPA .